Johnny Nitro's emergance as a singles competitor began in 2006. After racking up several WWE Tag Team Title regins, Nitro moved from SmackDown to RAW and immediately became a top contender to the Intercontinental Championship. He won the title in June of that year, then traded it back and forth with Jeff Hardy in the fall. 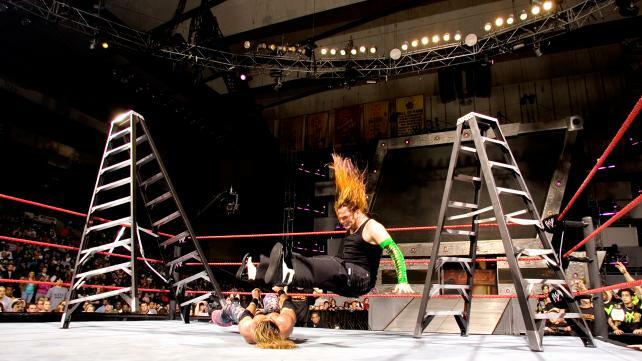 Their rivarly culminated in a Ladder Match on the November 20, 2006, edition of RAW. Hardy had all the advantages going into the match. He was the champion with a wealth of experience with ladders, while Nitro was taking a part in his very first Ladder Match. The veteran Hardy introduced Nitro to the ladders rather quickly, dropkicking one into his face in the early goings. The rookie put it up a good fight, evading Hardy's Swanton Bomb and countering with ladder shots of his own. However, Hardy's experience proved the difference. A powerbomb and legdrop off the top of the ladder allowed the enigmatic Superstart to trap Nitro under the apparatus as he retrieved his title.